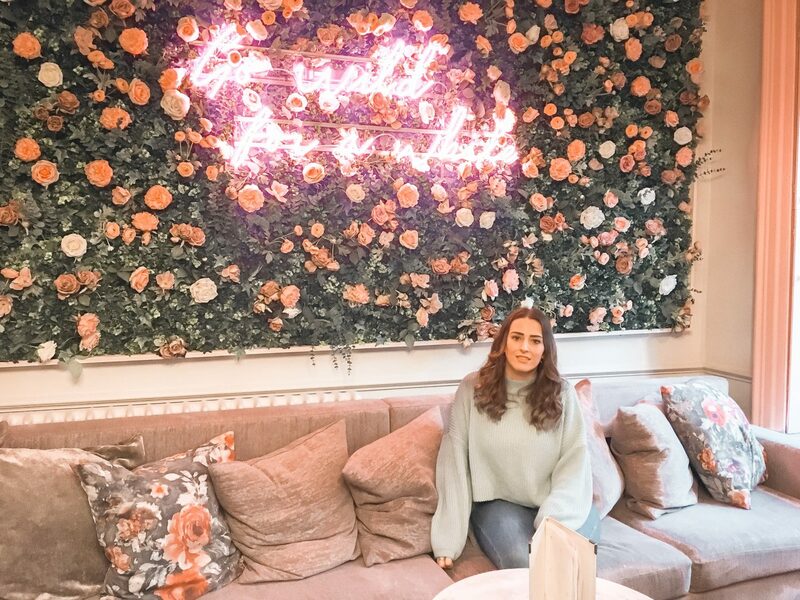 If you’re a fan of floral walls, incredibly floral cocktails and food good then The Florist is the perfect place for you! Based on Park Street, the botanical haven bar/restaurant opened in early in 2018 and serves up brunch on the weekends, a Sunday roast as well as their standard menu. As well as the Bristol branch, there is also a Florist in Liverpool and a new branch is opening in Watford. I visited The Florist for a Sunday Roast, for two courses it costs £18.50 and for three it’s £22.50, they also do an offer when for £10 you can get bottomless drinks (prosecco, bloody Mary’s or tribal ale). As I was driving back to Devon that afternoon, I didn’t take up the £10 bottomless offer, but it definitely is a good shout and something I will try in the future. I’d heard mix reviews about the food, but was excited to try their roast. There are four options for starters, five main course options, four sides and three puddings to choose from. I opted for the rotisserie-roasted lamb which came with mint sauce and seasoned with garlic and rosemary sea salt. 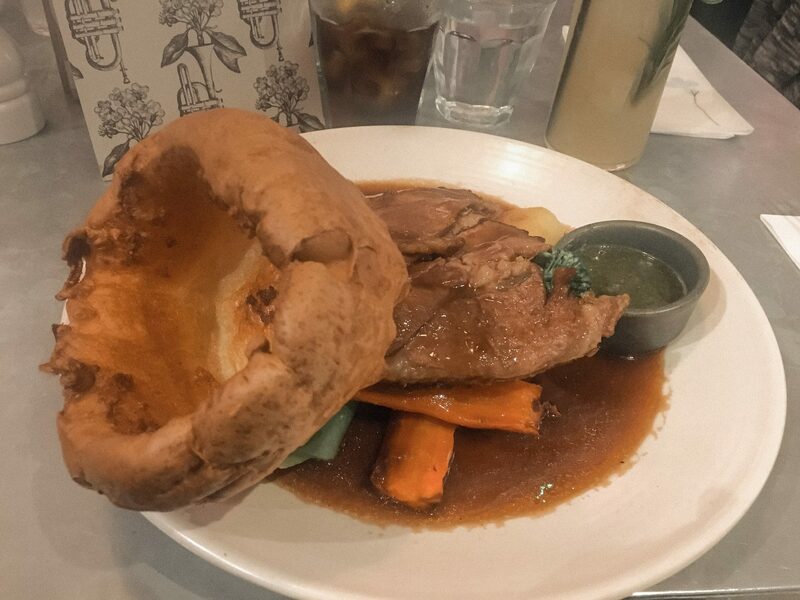 All roasts are served with carrots, red cabbage, tenderstem broccoli, roast potatoes, Yorkshire pudding and of course, gravy! 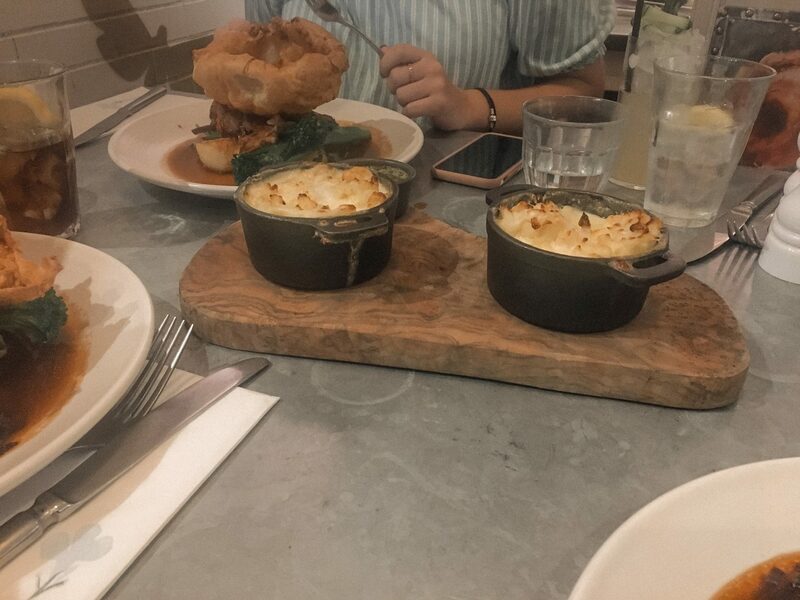 We also opted for a side of cauliflower cheese, as no roast is complete without the cheesy goodness! I have to say, I was very impressed with the roast and it is probably one of the best roasts I’ve had! The meat was tender, the roasties were perfect and the Yorkshire pudding was massive. For dessert I opted for the warm chocolate brownie with white chocolate, almonds and raspberries. The sauce was warm and even came in a little pot so you could pour over (I’ve also got a boomerang of me pouring it over on my saved Instagram stories!). 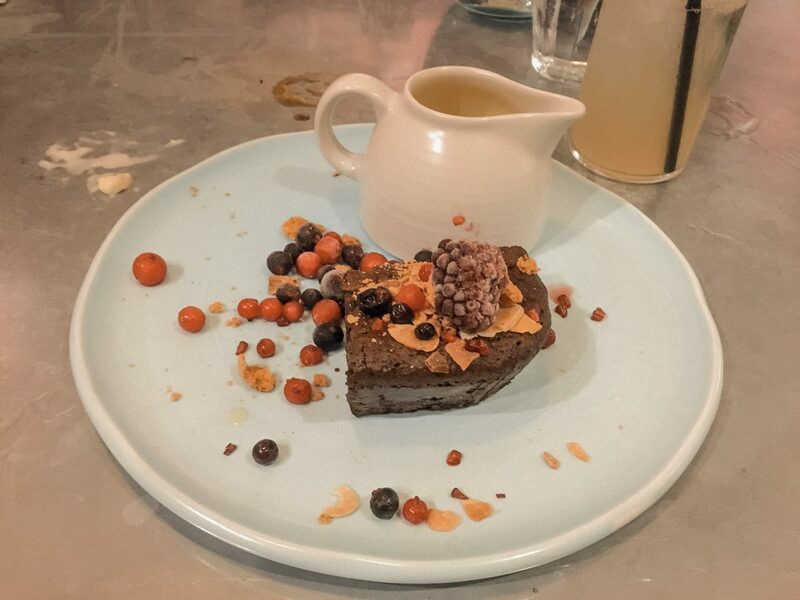 I was also incredibly pleased with the dessert, and it was just the right amount to fill me up! Known for their floral based cocktails, The Florist have an extensive range of cocktails and mocktails. I’ve had both cocktails and mocktails, and was equally as impressed with the both. From twists on the classic Pornstar Martini, Cosmo, Daiquiri and Margarita as well as original Florist cocktails, the impressive range of cocktails won’t leave you disappointed! 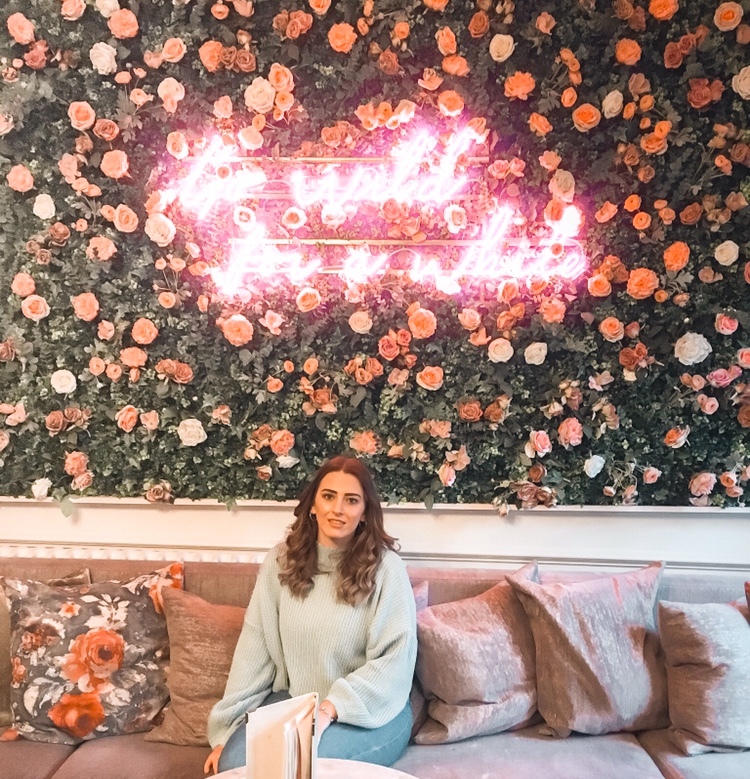 If you’ve read my blog before you’ll know that I am a floral wall fan, and what girl nowadays isn’t?! In the upper bar, there is an amazing floral wall with a neon sign saying ‘go wild for a while’. The aesthetically pleasing upper bar has an impressive seating area, making it the perfect place for a Saturday evening cocktail. In the evenings there is live music, and although I’ve not been to the Bristol bar on an evening, I spent an evening in the Liverpool branch. There was a DJ and a live saxophone, an incredible atmosphere and a place I would highly recommend for an evening out. As the Bristol bar is perfectly situated on Park Street, you can either go to a few other bars or spend all evening here! I was highly impressed with both the food and drinks, the staff were also welcoming which makes a difference. I’d like to spend an evening trying all the cocktails in the upper bar and try the normal menu during the day. All in all, I would recommend The Florist as it has a lot to offer! Next Post Will I Ever Buy A House?